I'm still plugging away at my House Cadmus Knight list. This time around it's a custodian unit. I'm running a crusader and two castellan (the wardens). I'm now at the halfway point on the knight list at least as far as actual knights go. Hopefully won't run out of ideas for the shoulder insignia. So far each one is unique. Just three more units and I'll be ready for some of the smaller stuff. Enjoy! Finished up another Knight Detachment, Errants this time. With these guys done I've just got two more knight detachments to go before the bulk of this army is done! Enjoy! I'm taking a bit of a break from doing my Knights to do up some adMech infantry. Hope you like them! I finished another group of AdMech stuff today. Not a whole lot but I've wanted some secutors and a magos for a bit. Hope you like them! Today's update gives me another two detachments for my Knight army. Just have 8 more knights to go before the army is done! I needed some AA guns for the army and Vanguard had some nice models that fit the bill. I'm quite please with them and I hope you like the result. So I've been a bit busy as of late with some larger life changes and I haven't quite had as much time for painting. I had one major goal this year to finish my epic knightworld House Cadmus list and I can now say I've successfully done so. It's been crazy and I didn't quite think I'd make it, but I finished out the last unit for the army last week. Because I've been crunched here at the end of the year I skipped taking pics of the lancers I finished up in November so I could put all my effort into the last unit. Hope you like them and I'll try to get an army shot here at some point! I'm sure you don't need us to tell you, but your work is (as ever) the finest I've seen. Some very tiny giant robots. Good Work. So having a kid apparently kills hobby time and commitment to painting standards. But, I did finally finish these two warbarques up which means I can say my Necron army is now complete! Enjoy! Man I'm getting slow these days, but progress is being made and another batch of Blood Raven armor is finished up. Enjoy! Beautiful as always. How do these scale next to the AT plastics? 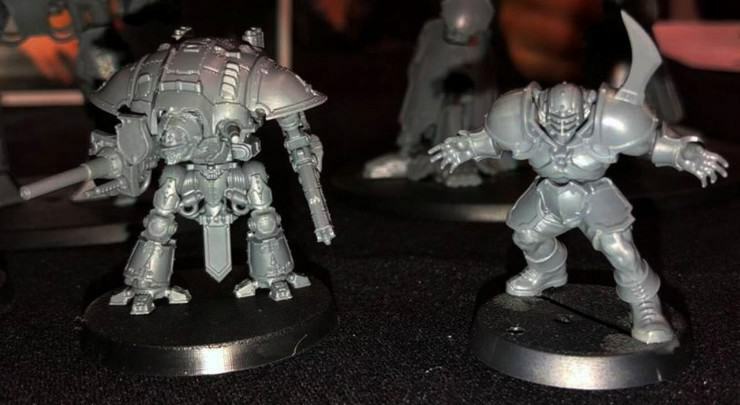 The 8 vs 6 is a bit unclear, as we haven't seen any humanoid but pictures of the back hatch of 28mm (FW) and 8mm (new AT) versions, the official sizes ("real" 33m vs big 22 inches vs 5 inches... so 28mm goes to 6.4mm). And maybe it was the reason for the cancelation of a Kickstarter. 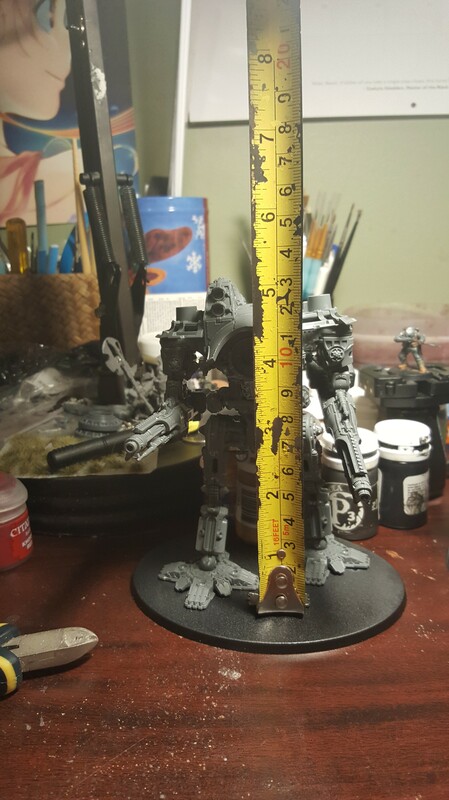 Warlord pose here is pretty straight, 130mm (120mm carapace). How tall are those others? The paladins I have are about 3cm tall.